How To Spot and Prevent Chimney Fires! Many chimney fires happen for one main reason: improper usage and care of wood-burning appliances like fireplaces and woodstoves. (Faulty installation is another reason) We’ll talk about proper usage and maintenance in a minute. First, let’s address the main problem at hand. A roaring sound—some people describe it as sounding like a freight train or a low-flying airplane—is typically the first indication of a chimney fire. If you hear this sound, and it’s growing louder, you probably have a fire raging in your chimney. 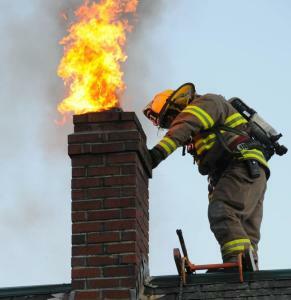 Clouds of black smoke and/or sparks pouring out the top of your chimney are other indications of a chimney fire. If it’s a big fire, flames can leap several feet above the top of the chimney. It’s definitely a “different” kind of fire that should be easy to spot. Call the fire department. The fire could be out before firefighters arrive, but it’s a good idea to call them anyway. Close the damper or the air inlet controls to the fireplace or stove. This can limit air supply and reduce the fire’s intensity. Get your fire extinguisher, open the door to the fireplace or stove just enough so you can insert the extinguisher’s nozzle, and shoot the contents of the entire canister inside and then shut the door. If you don’t have a fire extinguisher, baking soda or salt pellets work, too. But you’ll have to use a lot of either one to do any good. I know many people might think that getting water in the chimney would be a good idea…. BUT, it could actually make things worse by causing more steam and gas to enter the chimney, which could crack or warp it. So, just call the fire department and try the solutions listed above. Go outside: If the water to your hose connections is still turned on, you CAN wet down the roof and the area around your house (not inside the chimney, but outside of it). This will lessen the chances of sparks igniting other combustibles like shrubs and trees. Keep the water away from the chimney—wetting down a hot chimney could cause it to crack or even collapse. A quick way to snuff out a chimney fire is to use a chimney-fire suppressor. Available under several brand names—these flare-type devices snuff out flames by filling the chimney with a mixture of gases that rise up the chimney and cut off the oxygen supply to the fire. 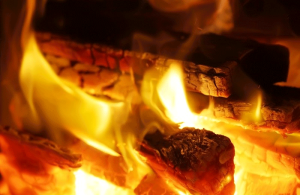 If you use your fireplace regularly, it might be worth keeping several of them around. Do not go inside your home until the fire department tells you it’s safe to do so. A large chimney fire can dump a ton of smoke and soot inside. There might be water damage to deal with as well. Whether it’s after a chimney fire, or to help prevent one…Don’t use your fireplace or woodstove until you have had a professional such as a CSIA certified fireplace chimney sweep come out and inspect the chimney. Chimney fires can cause a lot of damage to the chimney structure, including cracks and holes in the chimney wall, the flue, the flue pipe, and the flue liner. If the damage isn’t repaired, any subsequent fires could move beyond the flue and engulf closeby areas.